Tim and Kim met while they were students at Auburn University. They were married on October 23, 1999. They have 2 daughters, Kennedie (16) and Tess (14), and one son, Kade (13). They also have a Springer Spaniel named Jax and a lovable mutt named Barkley. They live in Auburn, Alabama. 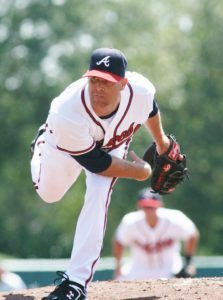 Timothy Adam Hudson was born on July 14, 1975, in Columbus, Georgia. He grew up in Salem, Alabama, a small community just outside of Phenix City. Tim attended Chattahoochee Valley Community College for two years where he played baseball for Coach B.R. Johnson. Tim then signed at Auburn University and played for two years under Coach Hal Baird. Tim retired from major league baseball in 2015 after 17 seasons. He played for the Oakland Athletics (1999-2004), the Atlanta Braves (2005-2013), and the San Francisco Giants (2014-2015). Tim was named to the MLB All-Star team four times in his career, twice with Oakland, once with Atlanta, and once with San Francisco. Before retiring in 2015, Tim was the winningest active Major League pitcher, as well as one of four active pitchers with at least 200 wins. Tim finished with a career record of 222-133. With a win against the Oakland A’s in July of 2015, he became only the 15th pitcher in Major League history to win a game against all 30 Major League teams. Tim is one of only twenty-one pitchers in Major League history to win at least 200 games, strikeout 2,000 batters, and have a win-loss percentage above 0.600. Of those twenty-one pitchers, fourteen of them are in the National Baseball Hall of Fame. In 2014, Tim became a World Series Champion with the San Francisco Giants. In 2018, Tim was named to the Atlanta Braves Hall of Fame and the Alabama Sports Hall of Fame. In his free time, Tim enjoys coaching Kade’s baseball teams, spending time at his farm, and serving the community through the efforts of the Hudson Family Foundation. Tim worships at Church of the Highlands in Auburn, Alabama. Kimberly Bruner Hudson was born on December 31, 1973. She grew up in Walton, Indiana, a small farming community in North Central Indiana. Kim graduated from Auburn University in 1996 with a Bachelor of Arts degree in Psychology and Criminology. Kim then attended Cumberland School of Law at Samford University. She graduated from Cumberland in 2000 and passed the Alabama Bar. She practices law at Davis, Bingham, Hudson & Buckner, P.C. in Auburn, Alabama. Kim enjoys spending time with her family, traveling, working out, reading, and the occasional nap. She worships at Church of the Highlands in Auburn, Alabama. The Hudson Family Foundation is a 501 (c)(3) non-profit corporation. Our tax ID number is 26-4239877. 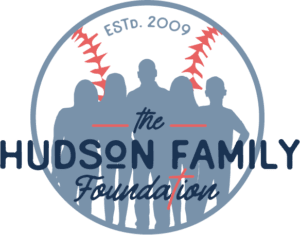 100% of your donation directly supports children and families in need through the Hudson Family Foundation. All contributions are tax deductible to the extent as allowed by law.